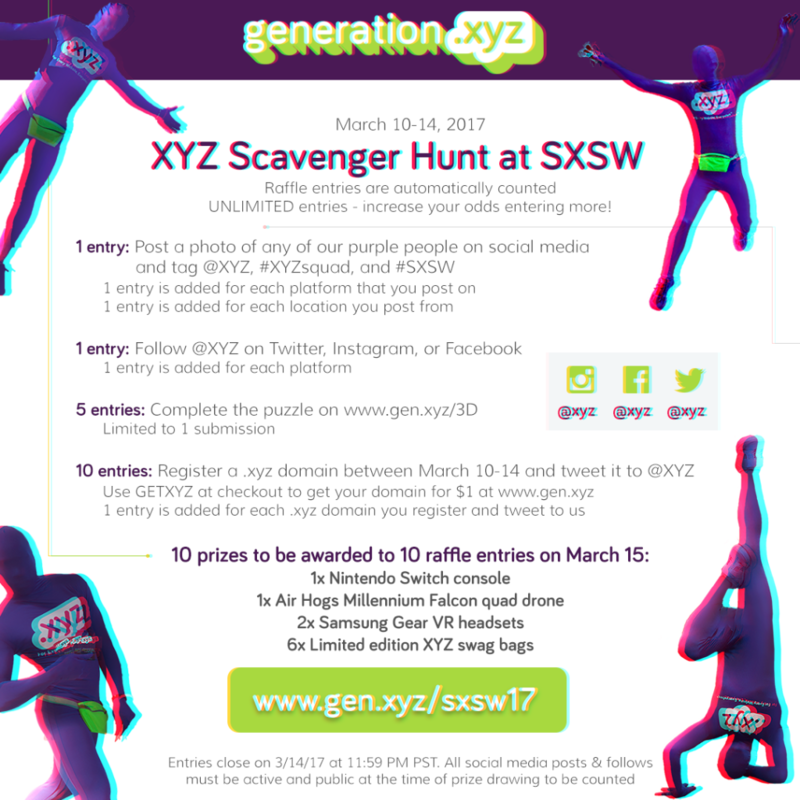 Check out the #XYZsquad on TV at SXSW 2017! 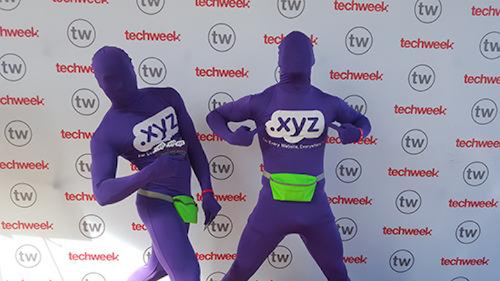 If you were at SXSW in Austin this month, chances are you saw the #XYZsquad running around the city parkouring, breakdancing, and taking pictures with thousands of attendees. 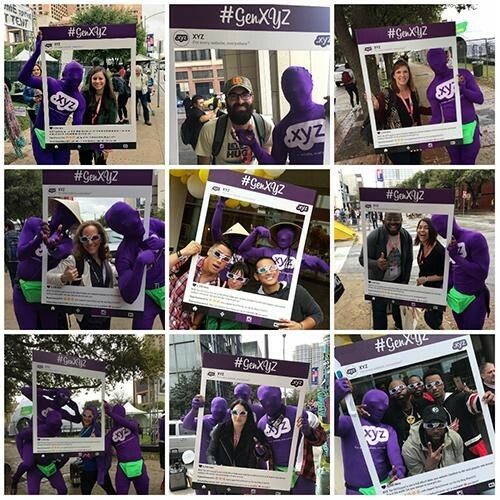 In fact, you’d be hard pressed to find anyone at SXSW who didn’t come across the #XYZsquad. You probably also saw our infamous 3D glasses in the crowds, with people checking out the XYZ 3D Lab on their phones. In fact, the #XYZsquad was such a hit that they were covered by Fox 7 Austin, Spectrum Reach’s Kernel, the official SXSW and Bravo Network Snapchat stories, and we even ran into Tyler Ward, who was covering SXSW for Comcast Xfinity! Our marketing initiatives ensured that everyone was learning about Generation XYZ. Many attendees remembered the #XYZsquad from previous years, especially from when they led the SXSW Parade. That’s not all, though! The #XYZsquad was also the highlight of our Scavenger Hunt, where attendees could post pictures with them for a chance to win some great prizes, including Samsung VR headsets, a Millennium Falcon drone, or the brand new Nintendo Switch! ICYMI, the winners were announced last week, so be sure to check out our Twitter for a full list of winners. We also had the pleasure of running into several members of #GenXYZ, including Ottia.xyz. 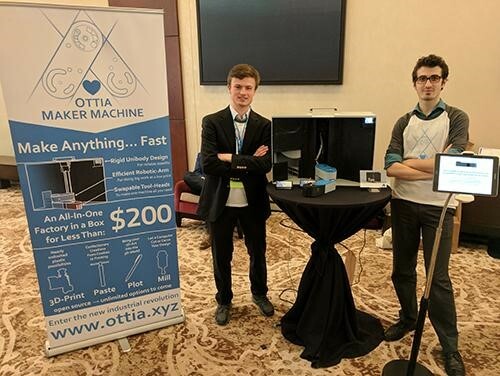 Ottia was at SXSW’s Tech Startup Spotlight showing off the prototype for their incredible all-in-one modular maker machine, which can 3D print, cut wood, and even frost a cake – all at an affordable price point! Keep an eye out for more on Ottia, including an exclusive video interview, coming soon. With another SXSW in the books and the team back home, we have already begun planning the next event – HostingCon in Los Angeles. 2017 was our biggest SXSW yet, but that doesn’t mean that next year won’t be even better! Make sure to follow us on Twitter to stay up to date on where XYZ is headed to next. Next week: XYZ hosting SoCal Tech Meetup! Spring has officially arrived and Team XYZ is excited to host this month’s SoCal Tech Meetup! This is the third time we are hosting an event like this, and we are expanding it further this year to include not only people from the domain industry, but also cybersecurity professionals and anyone else with a passion for technology. 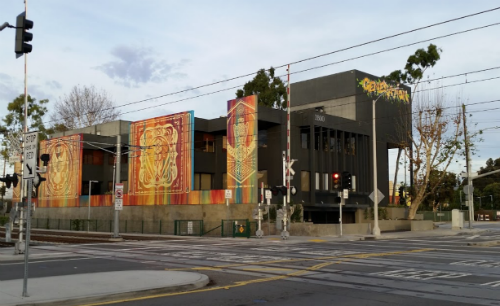 If you haven’t seen the XYZ office in Santa Monica before, it’s the building with the awesome mural by Shepard Fairey and Risk . You can’t miss us! If you happen to be in the area, stop by for a night of food, drinks, entertainment, and most importantly – great conversations. Be sure to RSVP and reserve your spot for the night! FLASH SALE: Get .XYZ domains for the whole family on Black Friday – Cyber Monday! 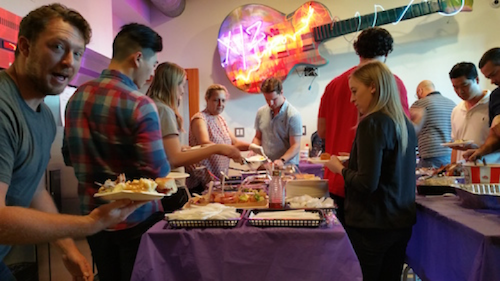 Thanksgiving week is here, and as you can see from our annual Office Thanksgiving Feast, we couldn’t be more excited to load up on delicious food for Turkey Day. But what we are truly excited for are all the great deals on .xyz domains that will be taking place between Black Friday and Cyber Monday with many of our registrar partners. If you don’t want to brave the crowds at midnight, don’t worry! You can get the most popular new domain extension in the world – .xyz, from the comfort of your own home. Just visit one of our registrar partners listed below to secure your .xyz for an amazing price, beginning Friday (be sure to follow them on Twitter – some of them may have some doorbusters starting earlier!). .xyz domains make for excellent virtual stocking stuffers, so why not register FirstNameLastName.xyz domains for each of your loved ones? If you’re still having trouble deciding on a domain name, check out our search tools, such as CNOX, which lets you search and download a list of every available .xyz domain that has already been taken in .com, .net, and .org (pro tip: pay attention to the registration dates of the domains too). For inspiration on what to do with your brand new .xyz domain, head over to our newly expanded list of nearly 200 of our favorite .xyz use cases at www.gen.xyz/live. Happy Thanksgiving #GenXYZ, and enjoy your cyber shopping! It’s safe to say that almost everyone likes a good party. You invite your friends, enjoy the food & festivities, and make sure there’s fun to be had for everyone involved. The celebration, of course, is the best part and will hopefully leave everyone with unforgettable memories. Just like any good party though, there’s always some cleanup to do afterward. Last week, approximately 50 of our registrar partners, countless resellers, and thousands of customers helped .xyz celebrate our 2 Year Anniversary. In a matter of a few days, over 3 million new .xyz domains were registered. Many of them appear to be registered by start ups, developers, and investors, and we can’t wait to see how the next generation of internet users will use these domains. So what does XYZ actually do to mitigate abuse? We have developed a sophisticated abuse monitoring tool which allows us to proactively monitor, detect in near realtime, and suspend domains engaging in any of the above activities, based on evidence. We have developed strong partnerships with many of the industry’s leading data providers to help us identify and eliminate the bad apples from the many good ones that we have in our namespace, which is why there is less than 0.1% abuse in the entire .xyz zone (nTLDstats.com, May 6, 2016). Once we have identified an abusive domain, we immediately notify the sponsoring registrar. Since we work very closely with our registrar partners, these domains are usually shut down in a very short period of time to prevent any harm to internet users. We then communicate with the registrants (either directly or via the registrar) to help them clean up their websites if they were hacked. In the off chance that someone catches an abusive domain before our data providers do, we have an abuse feedback system that allows internet users to report abuse 24/7. Please visit our Abuse Page if you have detected a harmful website or abuse from a .xyz domain name. XYZ strives to keep our namespace clean and to make sure that .xyz has the best reputation possible. If you have any feedback or suggestions, send us a tweet @XYZ or contact us. But a little cleanup behind the scenes doesn’t mean the party is over. We’re only one week into June, which means there’s roughly three more weeks left in our birthday month! Let the good times roll by visiting our 2 Year Anniversary page and register the domain(s) of your dreams today at one of our many registrar partners that are still celebrating this milestone with us. Those interested in bidding are encouraged to sign up at www.W263.xyz before the auction commences to ensure a timely registration (remember to fund your account for refundable security deposits – signup/bidding instructions can be found here). To learn more about this auction, read our full announcement at www.gen.xyz/blog/chinablogseriesauction. If you have any questions regarding signup/bidding process or about the auction in general, contact hello@gen.xyz with your inquiries. We are excited to announce that any business, organization, or individual can now register .Security, .Protection, and .Theatre domains. With these domains launching into general availability this morning, you can now secure secure short, authoritative names and establish yourself as a leader in your field. Another thing to get excited about is that there are no premium or reserved names. That’s right – all .Security, .Protection, and .Theatre domains have been made available for standard registration fees. That means you can secure just about any 1-character, 2-character, geographic name, or keyword on a first-come, first-served basis. Now is your chance to reserve highly desirable domains like 1.Security, Travel.Protection and Comedy.Theatre that will take your online presence to the next level. Are you ready for the best part? For a limited time, you can take advantage of our migration service and have your website transitioned to your new web address at no cost. To learn more, contact us once you’ve registered your new .Security, .Protection, or .Theatre domain. You can register your .Security, .Protection, and .Theatre domains at retailers worldwide, including GoDaddy, Name.com, and 101domain. You can also learn more at https://go.protection and https://www.Go.Theatre. Excited about your new domains? Show some love for @Security and @TheatreTLD on twitter and get your site featured! Variably priced premiums are officially available! What is a variably priced premium name? Variably priced premium domains typically have popular search and industry-specific keywords, like music.xyz or community.College. Due to their value and scarcity, they’re considered “premium” names and are available to register at a price relative to their value. Letters and numbers are also popular variably priced premium names. Since there are only 10 numerical characters and 26 letters in the alphabet, some of the most sought after domains are single-letter and single-number domains. Long story short: these are the creme de-la creme of .xyz and .College domain names. Why are we so excited about releasing these variably priced premium names? Because these names are an amazing opportunity for our #GenXYZ family. Your variably priced premium domain can help to advance your personal brand, business, idea, project…. the list goes on and on. Variably priced domain names can be the foundation for your branding and marketing, while aligning your web address with your mission. Shorter, industry specific names can help your SEO and make you THE authority in your industry or region. Best of all, you’ll get a memorable, highly desirable name that no one can forget. In some cases, variably priced premiums are sold by the registry in private sales (like 6.xyz) or auctions (like 88.xyz) for a high upfront fee. In these cases, the variably priced premium renewal rates are waived, and only standard renewal fees apply (recommended standard renewal rate is $10 USD). Customers who would like to make serious offers (high upfront fee and standard renewals) for domains designated as variably priced premiums may contact us. However right now a – z.xyz and 0,1,2,3,4,5,7 .xyz are now available for registration at premium renewal fees. Interested in finding out what variably priced premiums were released? Head over to www.gen.xyz/premiums – we have a list of all available variably priced .xyz and .College premiums, complete with recommended retail pricing. As a bonus, we’ve included .Rent variably priced premiums too! If you see a domain or two that you’re interested in, head to your registrar of choice to checkout.